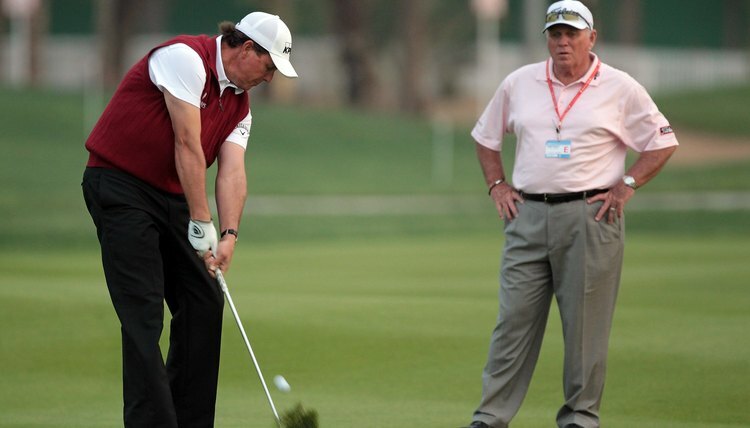 Long time pro instructor Butch Harmon helps Phil to hit the fairways in regulation. Golfers want distance and accuracy from their golf shots, especially off the tee. A fade to the right or a draw to the left can be desirable when the fairway has a curve or a dogleg. Sometimes, however, the tee shot will produce a slice or a hook. After analyzing the problem, there are some steps you can take to straighten out your golf shots for more accuracy. To hit the ball straight, use the correct grip, setup and swing path. Line up your body and the club to the target line at address, and take the club back with a shoulder turn until your arms are parallel with the ground. Keep your posture and balance, and refrain from swaying to the side. The wrists stay cocked until impact. When you make contact with the ball, the clubface should be square to the target line. The swing is completed with a strong follow through. A slice can occur when the angle of the clubface as it strikes the ball is incorrect. According to Golf.com, just a 1.5-degree variation in your clubface alignment can translate into a ball that lands 70 feet from the target. To find out what causes your slice, look at the trajectory of the ball. If it flies straight and then curves to the right, your clubface is open on impact. Or, if the ball starts out to the left and then curves right, your swing path could be outside-in. If the ball starts off right and ends up further right, you have an outside-in swing. Apply light pressure to your grip for an even tempo in the swing so the clubface hits the ball square. Make sure the club is lying across your fingers and not in the palm of your hand. Release the tension in your body, and lead the downswing with your lower body. Keep the club in the middle of your sternum as you swing through the ball. If you are still having trouble, try shortening the shaft, adding offset or changing the loft angle of the club. With a hook, the clubface is closed at impact and the swing might be inside out. Sometimes this is the result of rotating the wrists too soon in the swing, or not following through on the golf shot. A hook can also be caused by too strong of a grip. With a hook, the ball will spin in a counter-clockwise direction. To correct a hook, check your grip to make sure you can see only two knuckles of your left hand. If you see three knuckles, turn your hands slightly counter clockwise. Do not aim the body too far to the right at address, and check to see if the clubface is twisted shut at the top of the backswing.